Crashes with pedestrians spike in fall and winter as the weather changes and daylight hours decrease. Be a safe pedestrian. Visit ICBC site to see tips for pedestrians and drivers. We encourage students to walk or roll to school. The wet weather has increased car volume within our school zone and it is important to be mindful of others to ensure the safety of all students. The parking lot is for staff. There is one Montroyal family parking spot that was auctioned at the Parent Gala, the lucky winner has access for a year. Students should enter and exit the vehicle in the school zone at the top (by the lower parking entrance, see photo below) the safest is exiting curb side. Cars should only exit the school zone line at the top of the zone. It is like waiting in line, this means there is no parking, stopping, standing, idling, texting, or waiting. If your child is not there, circle the block and rejoin the line. If you need to assist students out of the car, it is best to park in a designated parking area on the street. Please make sure Grandparents or other caregivers are aware of our traffic policies and procedures. Parenting Facilitator, Sharon Selby will be delivering a NEW Parent Session on Conflict Resolution in the playground. 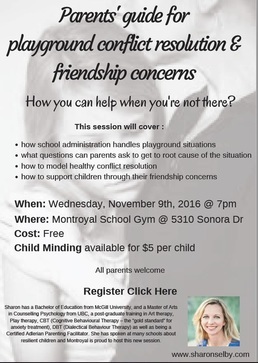 This workshop will provide parents tools and resources to no longer feeling helpless in their children's friendship issues or playground conflicts. Registration is recommended for the session and child minding (available for $5 per child). Parents are welcome to attend the assembly. School is not in session. If your children will be helping you manage a table, please find the student permission form HERE. ​This holiday season, the Montroyal Grade 7 class will be fundraising with Purdy’s Chocolates! This program gives 25% of the profits back to the graduating class for their farewell celebrations and other activities. It’s a delicious way to complete your holiday shopping. Consider using this fundraiser as a great way to do your corporate gift giving too! Looking for at-home assistance with Reading, Writing, and Arithmetic? Reading glasses found, please see Dianne Palgova in the front office if they belong to you! Have you been thinking of purchasing an Early Bird pass from Grouse Mountain? An Early Bird pass is the North Shore’s best value snowpass. Best of all, our PAC will receive 15% cash back for every Early Bird pass purchased using our schools unique promo code PAC-MONT. Please see HERE for further details. Please Note: If you have already purchased a pass, please call or go to Grouse Mountain Customer service to have the promo code PAC-MONT added to your account to ensure support of Montroyal. Attention Grade 4s & 5s! Want to ski and snowboard this winter? The Canadian Ski Council’s SnowPass™ lets you ski and snowboard three times at EACH participating ski area for $29.95. That’s a lot of skiing and snowboarding right across Canada! ​In March of 2016, parents/guardians, students, and staff were invited to participate in a survey to help inform our review of Policy 412: Homophobia. ​Responses from the Survey in Support of Sexual Orientation, Gender Identity & Gender Diversity in School District 44 were collected and reviewed by the Policy 412 subcommittee. SD44 is able provide you with Draft Policy 412: Supporting Sexual Orientation, Gender Identity & Gender Expression (HERE). Between now and November 9, 2016 (4 p.m. deadline) they are seeking your feedback on this revised policy. The SEED Society is a non-profit society dedicated to creating more kindness in our schools and society. This group is offering a FREE workshop on November 17th from 6:30-9:30 at The Silk Purse Arts Centre in West Vancouver. For More information and registration information, please click HERE and HERE. If your daughter is 9-12 years old and ready to experience the magic that is iGirl, it's time to sign up! Find out all the details HERE. ​If your children will be helping you manage a table, please find the student permission form HERE. This is the final concert for the term. We invite parents and family to join us! Find out more about the Montroyal Band & Strings program HERE.